home Inventions What is Hydro-dipping? Hydrography is known as Hydro dipping, immersion printing, water transfer printing, water transfer imaging etc. The hydrographic process can be used on metal, hardwoods, plastic, glass and various other materials. 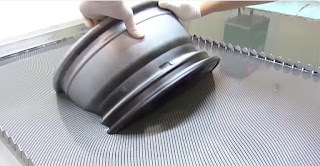 The water transfer printing process is extensively used to decorate items that range from entire all-terrain vehicles and car dashboards to small items like bike helmets or other automotive parts. The first hydrographic apparatus registered for a US patent was by Motoyasu Nakanishi of Kabushiki Kaisha Cubic Engineering on Jul 26, 1982. Water transfer imaging, or water transfer printing, is the process of applying decorative finished to 3D products. Any hard surface, non-porous and that can be submersed in water can be decorated. Another good rule of thumb is if you can get paint to stick to the object most likely you can decorate it with this process. Examples of such materials are: plastic, glass, hardwoods, fibreglass, ceramics, and metal. A Polyvinyl Alcohol Film (PVA) is printed with the graphics image to be transferred and is then floated on the surface of a large water tank. 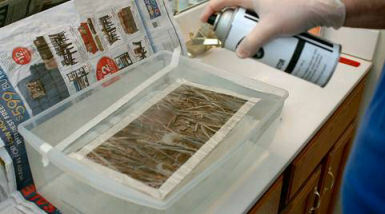 An Activator chemical is sprayed on the film to dissolve it into a liquid and activate a bonding agent. The piece is then lowered into the tank through the floating ink layer. The adhesion is a result of the chemical components of the activator softening the base coat layer and allowing the ink to form a bond with the object. After removing the piece from the water, the object is ready. also i need to send me quotation with some information details about your products. Shiny & Sticky side Should be on top! This is very informative and just plain amazing. I would love to do this as a hobby for myself. Where can i buy the pva from in South Africa? Do you have any handy tips for a beginner like me?